Nothing says good morning better than a loaf of freshly baked bread. Now with the advancement in technology and the non-fussiness of modern day bread-maker kitchen equipment, amazing your family and friends with your own freshly baked bread has never been easier. Thanks to the Zojirushi Home Bakery Mini Breadmaker, you don’t even need a lot of counterspace to justify a bread making machine. If you like eating freshly made bread each time and there’s just 2 or 3 of you, having a small machine means that there’s no waste. This versatile, highly programmable, and excellent bread maker is one of the highest rated bread makers in the market today. This 450 watt rated bread maker allows you to make smaller loaves of bread of up to 1 pound. The unit comes with numerous convenient features to allow you to make artisan style bread, cakes, pasta, pizza dough, and fresh jams. 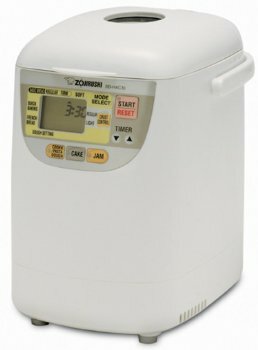 Here is what you should know about the Zojirushi Mini bread maker if you’re interested in getting it. We also have our top picks of other machines that are capable of making bigger loaves and some that excel at making gluten-free bread. Check out the price of the BB-HAC10 Mini Breadmaker on Amazon now! Excelling in design, this compact and unique bread-making machine features the highest state of the art technology in bread making. Standing at 8 x 11 x 12 inches and weighing 9 pounds, the unit’s vertical, slim, and compact design allows the machine to take up little storage and countertop space, so you won’t have to worry about clutter or overcrowding the area. The machine is also easy to carry around as it comes with a top carry handle so you can shift it from one position to the other or even take it with you elsewhere. The unit comes with an LCD panel and a viewing window. The LCD display is large enough for users with weak vision. The viewing window allows the user to monitor the baking process, therefore, you do not have to interfere with the baking process by opening and closing the lid repeatedly. Compared to many other bread makers, the Zojirushi HAC10 gives you the choice to control the texture of breads (regular bread, firm, and soft), and also has menu settings that let you make French bread, cookie dough, pasta dough, cake, jam, quick bread, rolls and croissants. The unit also has regular and light crust control settings that can be changed using a simple interface. In line with most customer reports, regular bread has a crunchy crust and soft texture which is a common characteristic exhibited by smaller bread making machines. The Zojirushi does not have a dark crust setting. It only has two settings, light and regular. The unit’s “Quick” setting prepares breads in less than two hours. While it doesn’t have a gluten-free setting like the larger BB-PAC20 model, the quick setting is a close substitute for those who need to use gluten-free ingredients. You can add nuts or raisins in the middle of the process. The unit will beep to alert you when it’s time. The Zojirushi uses a durable non-stick baking pan and one non-stick kneading blade. Small bread makers that make 1 lb loaves do not need two kneading blades. The nonstick baking pan is easy to clean. All you have to do is scrape off the dough and bread out of the paddle, wash it clean, and dry it for the next loaf. They cannot be washed in a dishwasher. For many homemade bread lovers, time is an important aspect. Fortunately, the Zojirushi has a 13-hour delay timer that allows you to make bread at specific times of the day. The timer can be pre-set at night after adding all the ingredients to the baking pan. You can wake up to freshly baked bread in the morning. Another major advantage of the Zojirushi is that it can get all the ingredients to the correct temperature before initiating the baking process. No need to proof the yeast first. It is important to note that this particular bread maker model does not offer you the option to choose time settings for the rise, bake, or kneading cycles. The machine is pre-programmed to handle those depending on what menu setting you choose. If you use the machine all the way through baking, the kneading paddle will leave a small hole in the center of the loaf. This is similar to all bread machines. Like all other products from Zojirushi, this unit comes with a one-year warranty. However, the construction quality as well as the sturdiness of the unit ensures that you enjoy satisfactory service throughout. The baking pan and kneading paddle are also available separately. The bread maker also comes with an easy to follow user manual. For instructions on how to care for your breadmaker, watch the video below. The unit conveniently fits on any kitchen countertop, is easy to transport and features a convenient carry handle. It allows you to make bread in under 2 hours if you’re in a hurry. There are enough menu settings for diferent textures of bread and for several other baked goodies. The advanced timer allows pre-scheduling of the baking process, helping save time for other household tasks. The programmable menu is easy to operate and the LCD display is easy to read. Although the 13 hour delayed timer is an effective feature, it cannot be used to bake bread with ingredients that spoil quickly, like milk or eggs, so this feature is best used only for normal bread. You cannot control the kneading, baking, and raising time. No special setting for gluten-free or sour dough. Check current price of the Zojirushi BB-HAC10.